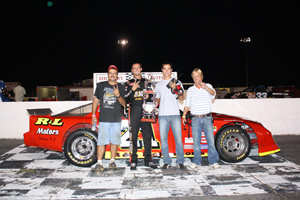 ( Newton, NC - - August 28, 2010 ) It was the perfect night for stock car racing as Hickory Motor Speedway hosted Autism Speaks Night presented by Pepsi Max and S&S Exteriors. 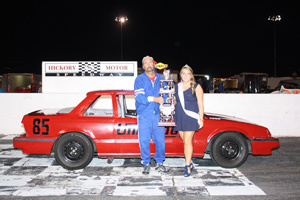 The night featured the NASCAR Whelen All-American with appearances by the Bojangles Late Model, the Advance Auto Parts Limiteds, the Everything Attachment Super Trucks, the Ford Focus Midgets, the Red Baron Race Parts Hobby Stocks and Twin 20-Lap races for the Hickory Street Stocks. The No. 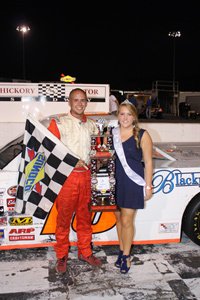 88 of Kyle Mansch found success again in the Bojangles Late Model 50-lap feature bringing home his sixth win of the season. With nine laps to go Canipe Jr., LeFevers and the No. 51 of Josh Wimbish went three wide heading off of turn four as they fought for prime race track real estate. LeFevers regained the third place position and held it until lap 42 when Canipe Jr. shot by LeFevers on the back stretch moving back into the spot. Meanwhile Mansch and Mercer continued to pull away from the rest of the top five as they extended their lead over the field. With four laps to go Wimbish pulled under Canipe Jr. looking to make his way into the top three. The two ran side by side until the final lap when Wimbish got loose as the two headed off of turn four, allowing Canipe Jr. to power ahead coming home third. Mansch captured his sixth season win as Mercer finished second. Wimbish finished fourth and LeFevers fifth. It didn't take long for the action to start during the Advance Auto Parts Limited 35-lap race as the No. 07 of Tyler Church made contact with the No. 8 of Mark McIntosh heading into turn two on lap two, sending McIntosh for a spin bringing out the first caution. The No. 21 of Monty Cox was caught up in the mix receiving minor damage to the nose of his race car. The second caution soon followed after McIntosh went for a spin heading into turn one on lap five. Caution number three waved on lap six after McIntosh got into the No. 37 of Walter Hoke heading out of turn three. At the restart the No. 15 of Sheflon Clay created a tight battle with the No. 11 of Matt Piercy, as he looked for a chance to earn a top five finish. The two battled side by side until the fourth caution fell on lap 10 after Cox spun around heading out of turn three. A tough battle for the lead continued as the field went back to green flag racing between the No. 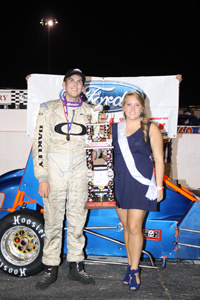 5 of pole sitter Dexter Canipe Jr. and the No. 12m of Austin McDaniel. Canipe Jr. began to inch away, but with 15 laps to go McDaniel pulled alongside Canipe Jr. and began the battle again. McIntosh continued his was to the front of the field breaking back into the top five with 15 laps remaining. The fifth and final caution came out on lap 25 after the No. 03 of Russell Stillwell spun around on the back stretch. The battle for the lead continued at the restart with Canipe Jr. out front. On lap 28 McDaniel shot ahead of Canipe Jr. and began to pull away from the field, leaving Canipe Jr. to duke it out with Church for the second place position. Canipe Jr. and Church drove side by side until the final lap with Canipe Jr. inching ahead as they came across the line coming home second with Church finishing third. McIntosh finished with a solid fourth place run and Piercy rounded out the top five. The No. 16 of Clint Fields led the Everything Attachment Super Trucks to the green flag for their 35-lap race. The No. 25 of Mark Johnson took over the second place position within the first five laps after starting fourth, but his run wouldn't last long as the No. 98 of Jody Measmer took over second on lap nine, leaving Johnson to ride around in third. As Measmer moved into second he immediately set his sights for Fields and the first place position. With ten laps remaining the No. 11 of Thomas Beane pulled under Johnson looking to take over third. Just as Beane was about to make his move the first caution flew for debris on the track on lap 26. Only nine laps remained as the field went back to green flag racing as Fields pulled away from the competition. Measmer followed behind in second as Johnson and Beane continued to fight for third. Beane was able to take over the position on lap 29 leaving Johnson to settle for a fourth place finish. The No. 69 of Trevor Hignutt rounded out the top five. The Hickory Street Stocks hit the track for their first 20-lap feature with the No. 21 of Roger Pitts II leading the field. It was a smooth sailing race with Pitts leading his fellow competitors around the historic short track for the entire 20-lap event. The front of the field quickly spread out behind Pitts II with the No. 1 of Taylor Stricklin running in second and the No. 9 of Charlie Watson running in third. The No. 25 of Jeremy Pelfrey began to put the heat on the No. 64 of Marshall Sutton as he looked for an opportunity to take over the fourth place position. Pelfrey dived under Sutton coming off of turn four, but Sutton pulled away. With five laps to go Pelfrey made another move for fourth securing the position on the final lap. Pitts grabbed the checkers with Stricklin, Watson, Pelfrey and Sutton in tow to complete the top five. The second 20-lap event for the Hickory Street Stocks was another caution free event with the No. 1 of Taylor Stricklin stating the race in the pole position. The No. 21 of Roger Pitts II was looking to sweep the night as he pulled into the lead on lap four, holding onto the position until he grabbed the checkered flag bringing Stricklin and the No. 09 of Charlie Watson along to complete the top three. With five laps to go the No. 64 of Marshall Sutton began reeling in the No. 03 of Kevin Eby as he looked for the chance to take over the fourth place position. Sutton pulled to the outside of Eby with two laps remaining. Eby was out front as they headed into turn three, but the two were side by side as they headed out of the turn. They connected as they came out of turn four on the final lap, getting Eby loose allowing Sutton to take over the fourth place spot, leaving Eby to come home fifth. The Red Baron Race Parts Hobby Stocks entertained the fans with their 20-lap event as the No. 31 of Steven Willis lead the pack to the green flag. Willis quickly fell off pace allowing the No. 85 of Jeff Weisner to grab the lead. The first and only caution came out on lap three for debris on the track. The No. 28 of Casey Pierce grabbed the lead on lap five, but his run wouldn't last long as Weisner moved back out front on lap seven. The No. -1 of Ronald McNeil broke into the top three on lap nine, leaving Willis to ride around fourth. The field continued single file until the checkers wave with Weisner in the lead. Pierce, McNeil and Willis completed second through fourth respectively. The Ford Focus Midgets made a special appearance on Autism Speaks night with the No. 55 of Nick Drake capturing the pole position while donning the Autism Speaks logo. It was a fast pace 35-lap event with the first caution falling on lap 13 after the No. 11 of Jarrett Andretti went for a spin in turn three. The No. 28 of Tyler Coffingion took over the lead on lap 21 and began to slowly increase is lead over the field. The second and final caution waved on lap 30 after Andretti spun again heading out of turn four. The No. 17 of Jeremy Frankoski reeled Coffingion in by the final lap, tapped his bumper as the two headed out of turn four, but Coffingion held on tight to grab the win. Frankoski, the No. 19 of Chris Lamb, the No. 14 of Scott Hunter and Drake made up the top five. 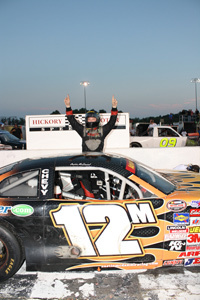 Known as the Birthplace of the NASCAR Stars, Hickory Motor Speedway celebrates its 59 th season of stock car racing in 2010. Opening the gates in 1951, Hickory Motor Speedway is the oldest professional sporting venue in Catawba County, and has been credited as the longest continually operating motor speedway in the country. 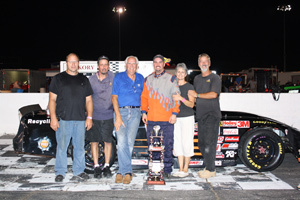 Producing drivers like Ned and Dale Jarrett, Bobby Isaac, Harry Gant, Ralph Earnhardt and Dennis Setzer, it's easy to see why Hickory Motor Speedway is filled with such rich stock car racing history and has earned the title of, Birthplace of the NASCAR Stars. The tradition continues as Hickory Motor Speedway hosts the 34 th Annual Bobby Isaac Memorial 200 featuring Late Model Stocks, Limited Late Models, the Tarheel Vintage Cars and the East Coast Flatheads. The show begins Sunday, September 5 th with qualifying for all divisions and feature racing for the Tarheel Vintage Cars and the East Coast Flatheads. Grandstands open at 3:30 PM, with qualifying immediately following. Racing action begins at 5:30 PM. Tickets are only $5 for adults and kids 12 and under are free. Don't miss your chance to enjoy the Fan Experience and ride around the historic short track with late model driver Josh Wimbish after the races. 5-lap full speed rides are only $70, so book yours today! The main events continue on Labor Day, Monday, September 6 th as the Late Model Stock Cars hit the track for a 150-lap feature event along with a 50-lap race for the Limited Late Models. Grandstands open at 2 PM, with an On-Track Autograph Session beginning at 2:30 PM. Racing Action begins at 4. Tickets are $15 for adults, $10 for teens & seniors, $5 for kids ages 7-12, with kids 6 and under free. 3 (5) Dexter Canipe Jr.
2 (5) Dexter Canipe Jr.